Payments via PayNow is preferred. However, if internet banking for PayNow is not supported, we do accept Credit/Debit card payments via Paypal. Kindly follow the instructions below to make payment. Looking forward to serving you! (1) Please key in your Booking Reference Number and the Deposit Amount in the fields provided. 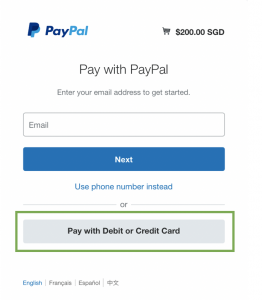 2) Click the “Pay Deposit to DP Clarke Quay with Credit/Debit Card via PayPal” button and leads you to the PayPal payment page. (3) Please check the address bar of your browser to ensure that the payment page’s site address starts with https://, instate of http://. This is to ensure that you are at a secured site. (4) Thereafter, select your payment method by paying with either Credit or Debit Card and enter the necessary details.